I’ve been spending the last week fiddling with my new bike (and hiding from the rain) and trying to find the right fit for me. If you spend a lot of time on the bike you’ll quickly realize that a proper position is the difference between bliss and eternal agony. This has sort of been the state I’ve been in for the past 5 years, with my too-small Canonndale (OK, blissful agony maybe..) and I want to nip it in the bud with the Bianchi. While skipping around the Web I ran across Competitive Cyclist, which has all sorts of useful information, videos AND a nifty fit calculator. It’s quite detailed (a universe away from the usual cursory look up and down I get at the bike shop when asking about fit) and after inputting 8 different measurements they spit out certain crucial bike measurements you should be looking for when sizing. But they don’t stop there and for this I’m grateful. These smart people realize that not everyone wants to ride like today’s pro racers; that some of us may want something a little more forgiving, but still fast. Therefore, I give you The Eddy Fit! Eddy, on the left, looks a bit more stretched out than does Andy Schleck, on the right. 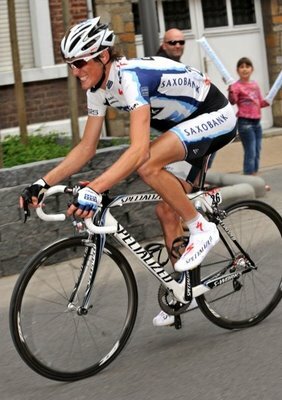 The reason, according to Competitive Cyclist, is that the length of the top tube on Eddy’s bike is longer than Andy’s. His saddle is also sitting a bit further behind his bottom bracket, giving him a sleek and powerful, yet (presumably) more comfortable position. Andy, on the other hand, is sort of scrunched up and looks to be leaning forward. This is the Competitive Fit, which is aggressive and fast, but maybe not the best for long hours (for mortals, that is…) in the saddle. These are their two bikes. They look like totally different machines, but the basics remain the same, e.g. 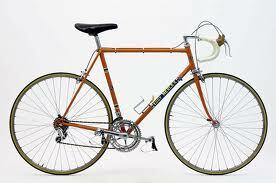 you still sit on a saddle, hold handlebars, and pedal around a bottom bracket. There is one more aspect of the Eddy Fit that makes it more comfortable and that is the drop from the saddle to the handlebars (if you draw an imaginary horizontal line from the tip of the saddle across). The difference between 1975 and 2010 is striking and really shows the aggressiveness (in position at least) that today’s riders are going for. If I did more than a few hours in this position I think my neck would probably freeze permanently in a ‘look at those pretty clouds’ angle! 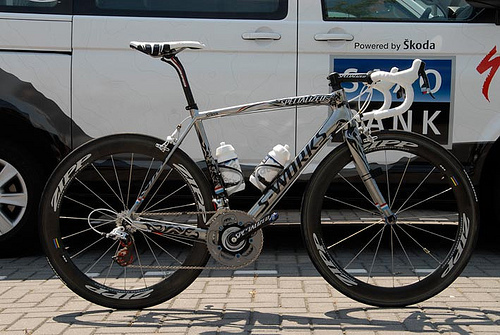 This entry was posted in Cycling and tagged Andy Schleck, Bike fit, Eddy Merckx. Bookmark the permalink. 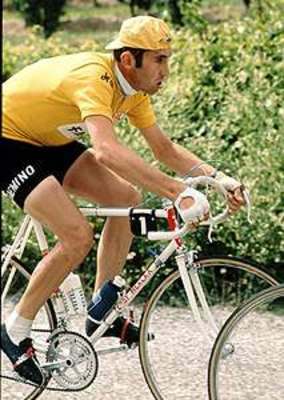 Eddy M. Went his entire career with an undiagnosed leg length discrepancy. It is in this way that he would adjust adjust and adjust….